GIVEN the density of cultural riches on the tried-and-true paths of the Anatolian mainland, few foreigners venture out to Çesme, Izmir’s sun-kissed western peninsula. But that’s slowly starting to change. Named after the many springs found in the area during the 18th and 19th centuries, Çesme has long attracted local tourists seeking out the healing thermal waters of the surrounding Sifne Springs. 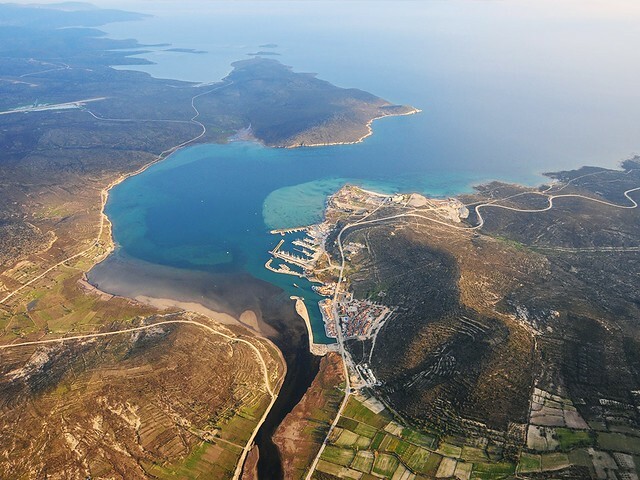 When tourists discovered the haunts of the Bodrum Peninsula, the smart set migrated north and the region still manages to remain relatively untarnished, offering a perfect balance between sybaritic and simple pleasures such as the appreciation of unspoiled stretches of fertile fields of aniseed and mastic trees together with enough understated luxury to satisfy the weekend Istanbulites. Dominated by Çeşme Castle, this 16th century Ottoman gem makes the town itself a worthy day trip, but Alaçati, with its density of historical restored Greek houses, wins hands down for stunningly preserved charm. Backed by hillsides of vineyards and olive trees, Alaçatı was once a sleepy fishing village overlooking a bare bay. Known as Agrilia in ancient times, it’s had many incarnations. During Ottoman times it was referred to as Alacaatlı (home to the Alacaatlı clan) and in the 19th century the Greeks called it Alatzata, a name believed to have derived from the word ‘alas’ (meaning ‘salt’) after the surrounding salt lakes. 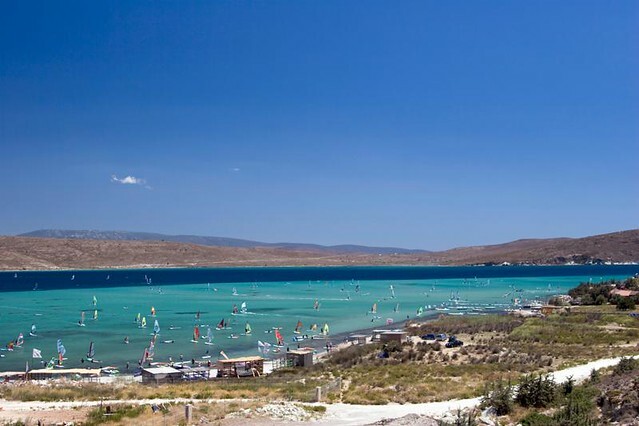 Located in the centre of the Çeşme peninsula’s ‘slim waist’ and swept with a consistent wind that eventually caught the eye of a sport longing for its northerly breezes, the area became home to a popular windsurfing school in the 1970s. The windsurfer’s paradise, shallow and forgiving for newcomers yet challenging for professionals, has transformed a quiet village with a population of about 10,000 to one that swells with more than 6,000 surfers every summer. It’s also a convenient base for its proximity to historic sites such as Ephesus, but the village itself is the main attraction, enchanting visitors with its historical beauty and rich folklore. It is one of the best-preserved towns in Aegean Turkey with the entire village achieving historical status in 2005, attracting Turkey’s intellectuals and artists with its traditional air of cobbled streets and original stone cottages. The opening of the Taş Hotel in 2001, which took an old crumbling Greek home and turned it into an upmarket boutique hotel was a great success, and since then many others have followed suit. Now there are dozens of boutique hotels to choose from, housed in both new and renovated buildings, many with swimming pools, exposed stone walls, and pretty courtyard gardens, providing an idyllic antidote to the anonymous, supersized resort hotels that have sprung up along Turkey’s coastline. Art galleries and high-end boutiques spring out from every cobbled twist and there is also a thriving wine and gastronomy scene to discover, but despite the influence of urban chic, Alaçatı still manages to maintain its mellow, rustic allure. Alaçatı became an Ottoman town in the 14th century and was originally settled by Greeks in the 17th century. After the defeat of the Ottomans in the Balkans, Moslem refugees fled to the western coast of Anatolia. The Greek population of Alaçatı was forced to leave in 1914 and the village was emptied. Most of the Greek returned in 1919 during Greek administration of Smyrna (1919-1922) when the Hellenic Army occupied the region of Izmir. The majority fled hastily with the retreating Greek Army following Greece’s defeat in the Greco-Turkish War, whilst others fled from the shores of Smyrna. The unilateral emigration of the Greek population, already at an advanced stage, was transformed into a population exchange backed by international legal guarantees. Under the Treaty of Lausanne in 1923 and according to the implementation of the compulsory exchange of populations, Muslims who lived in Crete, Thrace, Macedonia and Dodecanese settled in Alatsata city in the houses abandoned by the Greeks. Most of these houses still remain in Alaçatı as an attraction for people to see and absorb the feeling of life in the past. 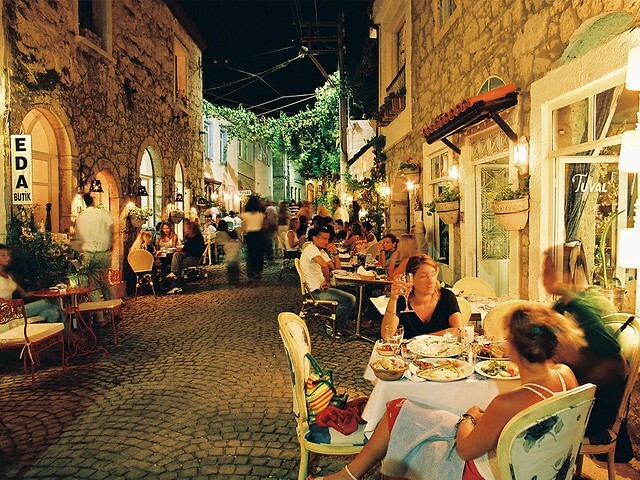 Food is a vital reason for visiting Alaçati with a wide variety of dining opportunities from simple cuisine to high-end gourmet experiences including slow cooking specialities and local Aegean tradition. 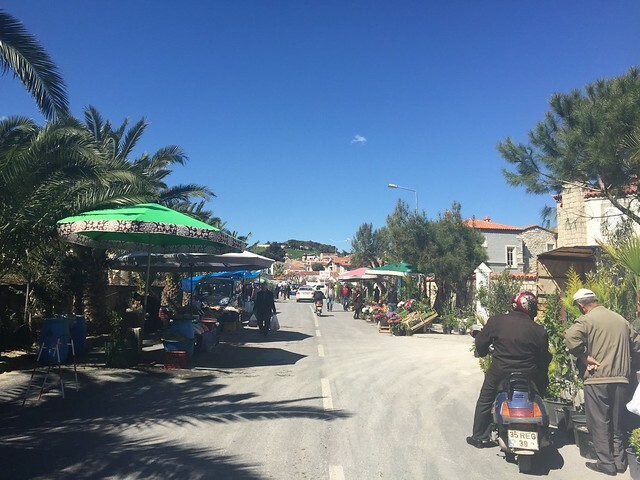 The Alaçatı Pazarı (Market) every Saturday on Şehitlik Caddesi (3000 Sokak), is the place to buy the region’s organic produce, especially seasonal Aegean herbs, as well as a whole array of textiles. The locals have been practicing natural nutrition for centuries in the region with numerous indigenous herbs that have been used traditionally both as edible delights and for medicinal purposes such as asebegümeci (or, malva herb, famous for its soothing properties and purple flowers), karabaş out (lavandula herb, revered for its aromatic properties as much as for its antioxidant benefits, turp otu (radish root) and şevketi bostan (a type of thistle) prepared in a number of ways. 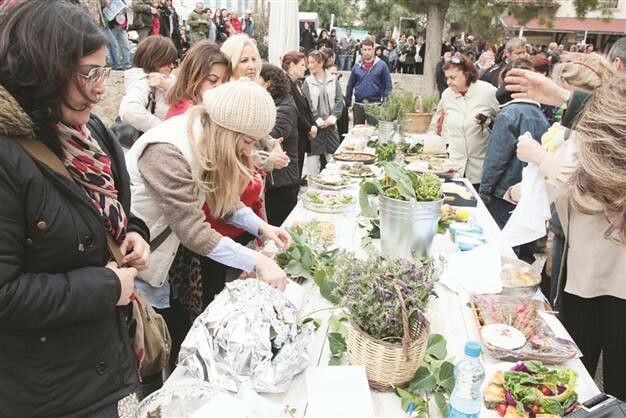 The residents are striving to maintain their native cuisine and host the Alaçatı Herb Festival every year in April to promote the importance of environmentalism and natural nutrition, bringing together culinary aficionados, foodies, nature lovers and locals for a weekend of events dedicated to passing on this legacy to further generations. The Vanishing Tastes Festival is another gastronomic highlight organised in June. Recipes are collected from local people and introduced during various restaurant events, street festivals, contests and workshops. If you can’t make either festival, Alancha, is one of Turkey’s most adventurous new restaurants, where windsurfer-turned-chef Kemal Demirasal adds creative flair to traditional Aegean recipes using modern gastronomy techniques with impressive results. 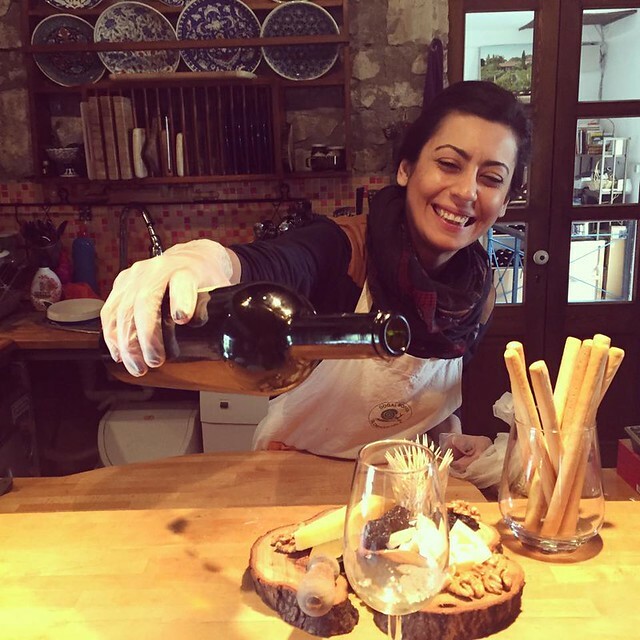 Asma Yaprağı (the Vine Leaf) is more a homely affair, but with the same enthusiasm for bringing local history to life. Dishes are a fresh fusion of local market and handpicked countryside produce and the open kitchen adds a warm familial comfort to choosing your plate from home-cooked classics like köfte and Aegean style moussaka to oven baked pasta with local herbs and pumpkin served in a garden of figs. Tucked away a few minutes from the square, one of the oldest restaurants in town is Agrila, a wonderfully laidback fine dining institution. Housed in an old tobacco factory, this local favourite serves well-executed Mediterranean dishes with a strong Italian influence in an elegant and romantic setting. It’s the place in town for a steak, if you need a break from the mezzes. Urla is the heart of Turkey’s wine renaissance and only 50km journey from Alaçati where you can sample wine made from the thousand-year-old vines. Urlice Vineyards is a family owned and operated boutique winery whose owners, a husband and wife team, Reha and Bilge Bengisu Öğünlü, oversee the whole vine growing and winemaking processes from the planting of the vines to bottling. The Öğünlü’s bought the property in 2004 and released their first vintage in 2008. The main goal at Urlice is to express the potential of this ancient viticulture through their vineyards of Cabernet Sauvignon, Merlot and Shiraz. Both ancient viticultural techniques and biodynamic laws are respected as well as painstaking efforts to remain chemical–free in the vineyards. In this light, wine making techniques are less interventionist and more dependent on good cellaring practices. 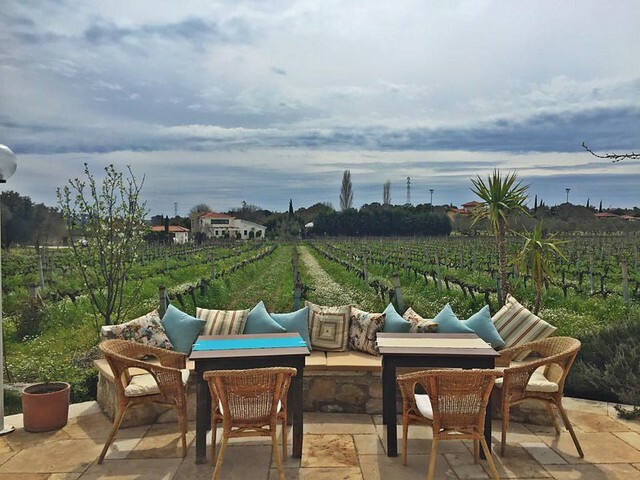 Urlice winery and tasting room is set amidst vineyards and ancient olive groves which is the perfect place to relax and enjoy the organic offerings. It is an old stone “kule” (tower) restored to its present single-story tasting room and underground cave where the wine is aged. The winery and the tasting room is open on weekends between 12:00 and 18:00. During the week days, you need to call for an appointment. At the other end of the production scale, Urla Şarapçılık is a technologically advanced operation of sleek, gleaming proportions. After discovering vineyards over a thousand years old on the slope of his farm in Urla, Can Ortabaş started some research and found out that the area’s former main sector had been wine for thousands of years previously. The foundations of Urla Şarapçılık were laid when Mr Ortabas and Uzbas Ltd started their own vineyards ten years ago and started working on how to promote the town of Urla as a town with it’s own wine brand. Urla Şarapçılık carries out production in its own controlled vineyards with a range of domestic and foreign grape varieties. While most of its wines are produced from international grape varieties, it has some Turkish grape varieties worth exploring as it continues its R&D studies with The Scientific and Technological Research Council of Turkey in order to select the clones of varieties long vanished in the region. Nero d’Urla is one Turkish grape variety doing well and since this young winery released its first vintage in 2009, it has received plenty of international recognition and awards for the high quality on offer. Thanks to year-round high winds, shallow waveless water, and wide-open space, Alaçatı bay is one of the top three wind surfing spots in the world. Surfers from all four corners come here to participate in the PWA Windsurf World Cup, in which thrill-seekers compete in a stunt-filled challenge of wits and skill. Alaçati Surf Paradise Club (closed Nov-Mar) makes it all possible by renting various models by the hour or by the day, with or without instruction. If you’re more of a casual observer, stake out a lounge chair and umbrella at Babylon Alaçati Beach Club for a high-quality marathon of sun, fun, relaxing and nightlife rolled into one. A strip of sand over 1.5km (a mile) long, Ilica Beach is the longest beach on the peninsula and also the most popular. The steamy Ilica spring bubbles up right in the middle of a rock-sheltered corner of the marina, which attracts locals and visitors alike with the opportunity to partake in the healing properties of the water. Alavya, the town’s first luxury resort, opened in the centre of town in summer 2013. Set in a walled garden with courtyards and fruit trees, it is the most obvious symbol of the town’s reinvention. The hotel was the brainchild of construction chief Erol Tabancak and his wife, Rana, who hired Turkey’s most famous interior designer, Hakan Ezer, and chef, Carlo Bernardini, to develop their concept of casual luxury. Spread over six restored stone houses, the 25 stunning rooms are divided between the houses with each uniquely and elegantly designed. The works of famous contemporary Turkish artists cover the walls and the exquisite interior design takes care to stay true to local flavours and textures. Food is of vital import to the concept and the hotel’s restaurant, Mitu shares authentic local flavours on the plate and in the glass from the first coffee of the day to the last raki at night. Food here is prepared with pure enthusiasm with a focus on authentic local flavours both for the plate and glass. And it’s been well received by the east’s high rollers – Muhtar Kent, the head of Coca-Cola, recently hosted an intimate dinner there. Located away from the crowds in a peaceful part of Alaçatı’s main street full of shops, Bey Evi Alaçatı offers 15 unique rooms designed in minimal white with air conditioning and free Wi-Fi. Housed in a beautiful renovated Greek stone structure, each room is furnished carefully in harmony to create a pleasant and relaxing atmosphere. The interior exudes a unique character and charm reflecting the warmth and hospitality of its owners which gives you a sense of staying with friends rather than the fleeting anonymity of being a hotel guest. Celal, the proprietor, and his staff do their utmost to please and his local knowledge and insight is delivered with a refreshing zeal. Start the day with a rich breakfast spread including tomatoes, olives, local cheeses, honey and clotted cream, homemade jams, and a selection of fresh breads and pastries. There are a variety of different cuisines to choose from every evening before rounding off the evening with a long nightcap in the garden. Pegasus Airlines flies direct from Stansted and Gatwick to Izmir, which is an hour’s drive from Alaçatı. Easyjet flies direct from Stansted to Izmir during high season.